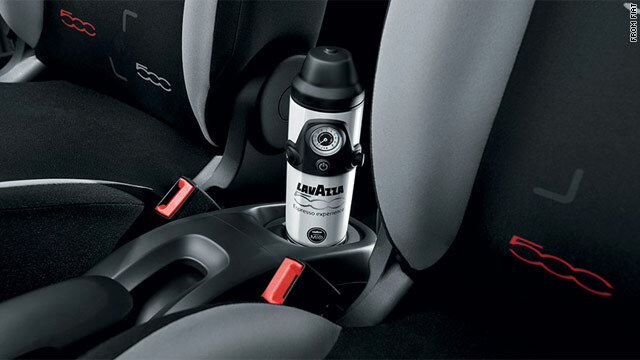 Fiat shows the Lavazza espresso machine built and docked into a console in the new European model of the Fiat 500L. Drivers love fancy technology extras packed in their car and Fiat is hoping their latest innovation may be the best yet - one that can save you a trip to your favorite coffee store. But the car designers new innovative addition to their latest line, due out in Italy in October, is landing them in some hot water with some consumers concerned about it adding to a mounting list of things that distract drivers. However, the car maker says, don't rush to judgement, you can't brew up a cup unless your car is stopped. Their new crossover model the Fiat 500L boasts a whole range of accessories, but the one drawing the most attention and perhaps concerns, is their built-in espresso machine. That's right. Forget your Starbucks runs, or trying to rush out the door to work with your homemade brew. Instead, inside your console you'll find a "new coffee machine created in collaboration with Lavazza," considered to be the Starbucks of Italy. "The 500L is the first standard-production car in the world to offer a true espresso coffee machine that utilises the technology of the 'A Modo Mio' pods," the company said in a press release. "It is perfectly integrated in the car with a deck designed expressly by Fiat." A video put out by the automaker shows a cartoon character couple debating the choice of having to make a coffee run. But no longer! "Do you want to take a break while flavouring the best Italian espresso coffee without stepping out of the car? With 500L even this will be possible!" the company touts on its Italian site. Passengers can brew on the road, filling the car with the sweet aroma of drink of the tired.
" It will be possible to enjoy ... inside a car the high quality, the unique taste, the body and creaminess of the true Italian espresso," the automaker boasts. While it is certainly a first-of-its kind offering, the function has been met with a lot of criticism in the U.S. about concerns that drivers don't need another distraction while driving. Most of the focus of distracted driving campaigns have focused on texting, including a new set of public service announcement commercials from AT&T that show the fatal consequences of multitasking while driving. So, when news of the coffee meets car collaboration hit the Web in the U.S., people on Twitter took the car company to task, noting that while we can't drive while texting in many places, it doesn't seem like a stellar idea to be making scorching hot coffee while taking your car to the road. It was unclear if those criticizing the idea knew the machine only worked while the car was stopped, a detail that was not touted on the car's site or in many media pieces criticizing the idea. Even TV host Tom Bergeron weighed in on the idea, remarking that the innovative addition may be more dangerous than impressive. And it prompted responses from others that wondered whether it would lead to lawsuits, similar to the infamous McDonald's scalding hot coffee debacle and concerns from auto blogs and writers about the safety of the innovation. But the automaker wants to make a few things clear in the wake of the sudden uproar about the espresso machine's safety. They say they've done the testing and they are sure their setup is safe for drivers. "You can use it only when the car is stopped," Norman Winkler, the communications press officer for Fiat in Europe told CNN. "It's quite tiny and it has a docking station in which it remains locked. The quantity of coffee is much (less) than usual use in the cups in the states. Its espresso, it's very tiny." And it's not even clear whether those who are outraged in the U.S. will even have to deal with the issue. Jiyan Cadiz, the spokesman for Fiat in the U.S., said it was too soon to say what features might or might not show up in the American model. "We have not provided any product details at this time," he told CNN. "As we get closer to our own launch of the vehicle we’ll provide feature availability and specs and more context between the Euro cousin and the U.S. model." Great idea. Now people can make coffee in between texting and talking on their cell phones. II've owned 2 FIATs (both with ABARTH mods) and loved them both – an 850 Spider, bought when I got back from Vietnam, replaced by a 124 Spider, eventually replaced by a JAG XKE V-12. Given the cost of ownership, the FIATs were great cars, and I hope to own a 500 Abarth someday – and by that time, I hope it has an espresso option like the 500L!